The following case demonstrates a patient with recurrent episodes of pericarditis. Deformation imaging reveals a potential early sign of constriction. A 50-year old man, known with recurrent pleuritis was sent to the outpatient clinic. The last episodes of his pleuritis were associated with pleural effusion and complaints fitting with a pericarditis. Initial echocardiographic examinations showed a moderate degree of pericardial effusion (not shown). After tapering of his pericarditis treatment (i.e. colchicine and NSAIDs), there was a recurrence of his pericarditis. Additional investigations of the underlying cause were all negative (cultures/histology/PCR of pleural effusion and testing for auto-immune disease). The most likely cause in this case was either post-viral or idiopathic. He was sent to our institution for analysis of the cause and whether there was a risk for constrictive pericarditis. There were no signs or symptoms fitting with the latter diagnosis and the basic echocardiographic examination showed the following. The first image clearly shows a large amount of pleural effusion. When focussing on the heart, there is no significant amount of pericardial effusion. However, it can be appreciated that the pericardium is thickened at both the anterior as well as the posterior side of the heart. 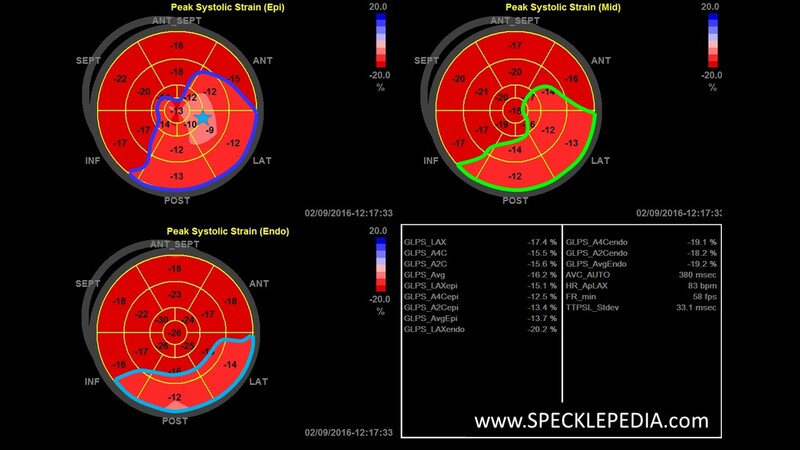 The LV systolic functions seems preserved. There is no septal motion suggestive of constrictive pericarditis. Both the short axis views and the RV inflow view conform the extend of the pericardial thickening around the entire heart. 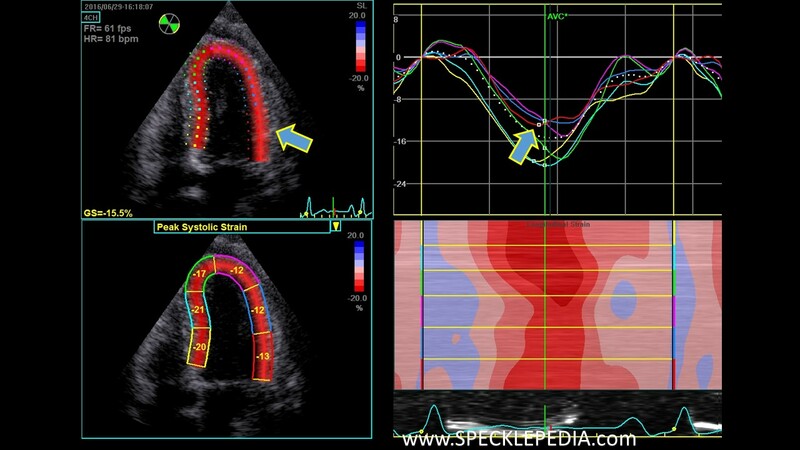 Apical views show a preserved LV systolic function. The LVEF by 3D is 56%. There seems to be the impression that the posterolateral wall is hypokinetic. The RV systolic function is moderate and there is a small amount of pericardial effusion behind the right atrium. 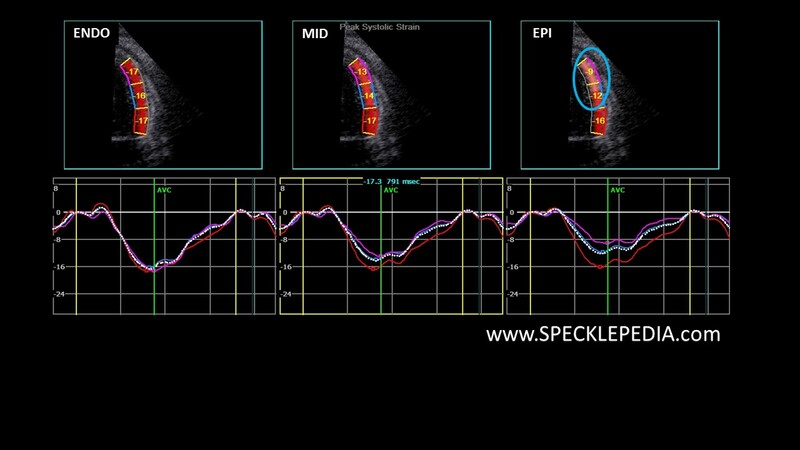 Doppler interrogation of both the mitral and tricuspid valve show some variations with respect to in/expiration. However, this variation is still within normal limits of physiology, not fitting the Mayo Clinic criteria for constrictive pericarditis. Finally, the hepatic vein pulsed Wave Doppler recording only shows flow reversal after the atrial contraction (indicated by orange arrows). 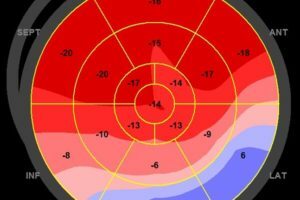 There is no diastolic flow reversal. When putting focus on the 4-chamber view, the difference between the septal wall and the lateral wall become clear. First, note the thickened pericardium at the lateral wall. 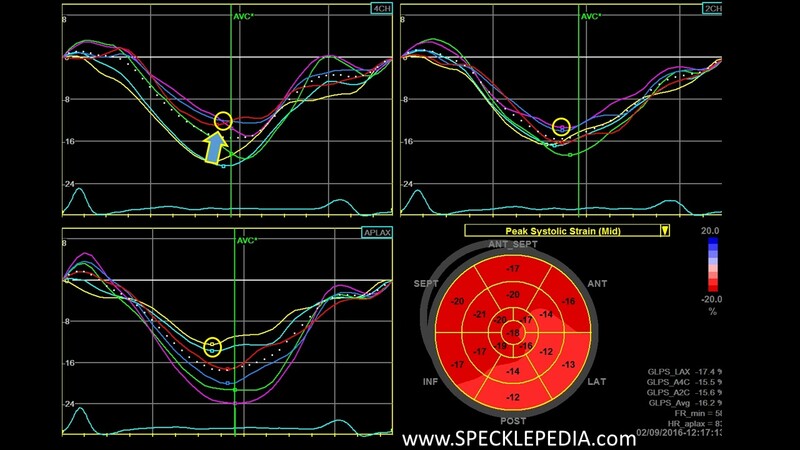 In the lateral wall, all three segments from base to apex show a reduction in peak systolic strain values and no clear post systolic shortening (arrow in top right graph). 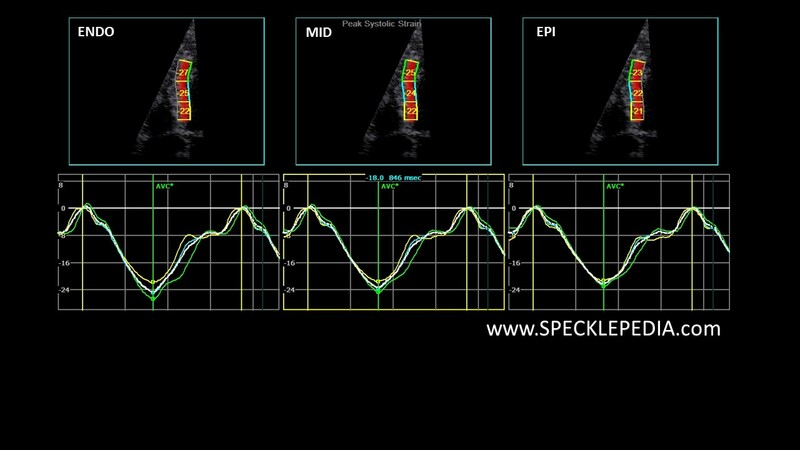 The deformation values and graph characteristics of the septal segments are normal. 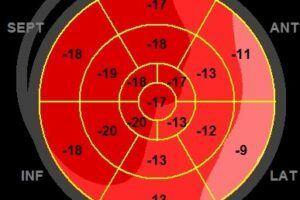 If we now look at the difference between the epicardial deformation values and compare these to the endocardial deformation values, a very typical sign is found. At the endocardium (shown on the left and indicated by ENDO), strain values are moderately reduced at the lateral wall and normal in the septal wall. 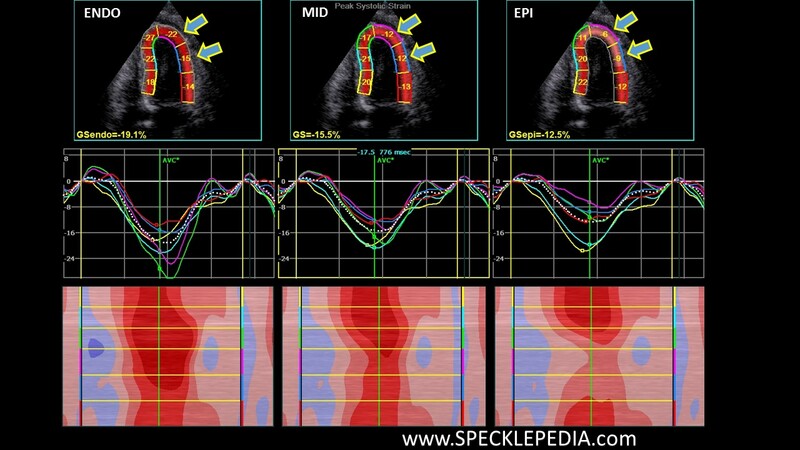 On the epicardium however (show on the right and indicated by EPI), the peak systolic strain values are severely reduced. This is very suggestive of adhesion of the myocardium and the pericardium, restricting motion. We took specific care not to include the pericardium in our region of interest (ROI). 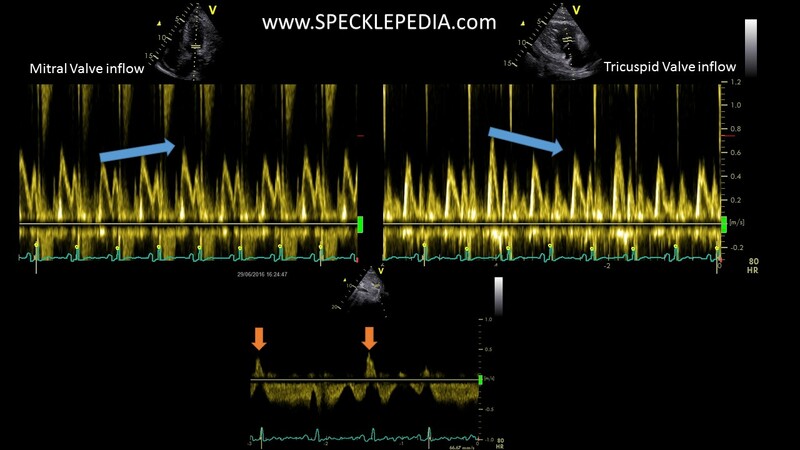 In the two figures below, the single wall recordings of the septal wall and the lateral wall are shown. This again shows the restricted deformation at the apical and mid lateral wall.